It was in the fall semester of my freshman year when I came to the horrible realization that oftentimes the course description has nothing to do with the material actually covered in class. I had actually started attending college courses at the age of fifteen, but all of these courses had been math or science based. As I was attending a liberal arts college, I was required to take humanities courses. I chose the one that seemed most interesting to me: a course that would analyze the cultural depictions of piracy throughout history – in particular, through the analysis of literature, film, and opera. My enthusiasm for this course was unbounding, until that is, I actually found myself in it. The demographics were as follows: over 80% of the class was male: white, Anglo-Saxon, Protestant males from the South. The material covered in the class was not as presented to us originally – indeed a great deal of the class (readings and discussions) focused on the homosexual tendencies of pirates. It was a disaster waiting to happen. Needless to say, I felt like complaining of false advertising; all I wanted to do was study some opera on pirates! I started planning my revenge. Instead of a traditional presentation, I presented my conclusions in a sing-along I wrote: “The Modern Pirate Queens” (sung to the tune of Gilbert and Sullivan’s “I Am a Pirate King” from The Pirates of Penzance.) Needless to say, the blushing of my male peers and my professor as they were forced to mumble out the lyrics “The Modern Pirate Queens / with smoldering stares / surprising clean / with fishnet stockings. / They are our pirate queens!” made up for that entire semester of false advertising. (I am not sure if it was the quality of my work or my audacious unconventionality – in both my means of collecting data and my overall presentation - which earned me an “A” for the course.) I share this anecdote to bring up an entirely different form of piracy: the piracy which is currently taking place off the coast of Somalia. 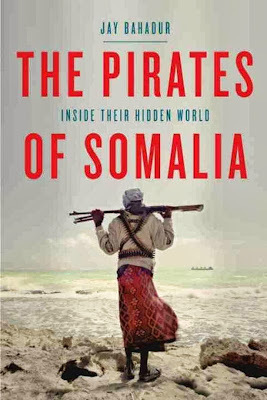 This was the subject of Jay Bahadur’s book, The Pirates of Somalia: Inside Their Hidden World. Piracy in Somalia has indeed been a hot topic in the US media, particularly since the Maersk Alabama ship-jacking in April 2009. In this instance, it was the first time that a ship with the US flag had been successfully hijacked by Somali pirates. It also ended with a dramatic showdown, with US Navy SEAL marksmen shooting three pirates on a lifeboat where Captain Richard Phillips was being held captive – leading to his subsequent rescue. The incident was popularized when it was made into a movie starring Tom Hanks. I also appreciated how the author not only discussed the negative effects of piracy on the international community, but also the negative effects of piracy inside Somalia itself. While first seen as heroes, pirates are now seen as a scourge by many Somalian people – based on economics. When a group of pirates receives ransom for a ship, there is a huge influx of foreign currency into the tiny Puntland economy – driving up the prices of everything (including basic necessities such as food) and negatively affecting the law-abiding Somalis.